A few months ago I mentioned buying coconut oil as a healthier option for the typical fats and oils many recipes require. I’ve used it in Sour Cream Coffee Cake, pancakes, brownies, cookies and Deep Dark Chocolate Cake and have been very pleased with the results. A couple of different brands of coconut oil have been on my pantry shelf since then, but my favorite is Tropical Traditions. It has a wonderful flavor and works well for all my cooking needs. I’m also impressed with the wide variety of healthy products offered by Tropical Traditions. Not only do I get to brag on this great company today, I also get to host a giveaway for a quart of their Gold Label Virgin Coconut Oil! For your first entry in the giveaway, you must subscribe to the free Tropical Traditions e-mail sales newsletter which will notify you of weekly sales, free product specials, free recipes and more. Please leave me a comment letting me know that you have signed up for the newsletter. This entry is mandatory and must be completed prior to submitting bonus entries. There are three ways you can earn bonus entries. Please leave a separate comment for each entry. Visit Tropical Traditions Free Coconut Recipes website, choose a recipe you would like to try, then return to my blog and share which one you selected. Tweet about the giveaway using the following: @GirlstoGrow has a #giveaway for @Troptraditions 32oz. #Organic Gold Label Virgin Coconut Oil! Ends 7/31 http://goo.gl/fb/imS32. This can be done once daily. This giveaway is open to residents of the U.S. and Canada. It will end on Saturday, July 31st at 8:00 P.M. EST. The winner will be selected by random.org and have the prize shipped directly to them from Tropical Traditions. 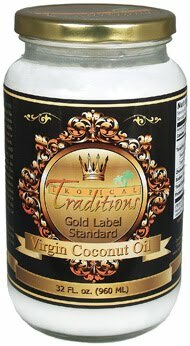 If you would like to place an order with Tropical Traditions, you can receive a complimentary copy of their Virgin Coconut Oil book by taking part in their referral program. Upon entering your account information, choose “Referred by a Friend” when asked how you heard about Tropical Traditions. Enter User ID: 6412336 and the book will be automatically added to your first online order. If you have any difficulty, visit their customer service page for assistance. Disclaimer: Tropical Traditions provided me with a free sample of this product to review, and I was under no obligation to review it. I was not required to write a positive review or sponsor a product giveaway in return for the free product. We love coconut oil. I haven't tried Tropical Traditions yet. Would love to sample it. What a neat giveaway, Tracey! 🙂 Within the past couple of years, I just began learning about the benefits of coconut oil. I subscribed to their newsletter! I have been wanting to try this! I subscribed to the newsletter. My first thought for the recipe was coconut fried shrimp, but the Coconut Shrimp and Rice might be even better! I'm following Tropical Traditions on Twitter! I would like to try the coconut peanut butter cookies. I subscribed to their newsletter. I have been eager to try coconut oil! Wow – I didn't know that recipe site was there – I can't wait to try the Chicken Cacciatore recipe along with several others! The smoothie recipes look great too! We would like to try make their Gluten Free Pizza Recipe. I am excited to try Tropical Traditions Coconut oil! I am signed up to get their email newsletter. I had just bookmarked the coconut recipe site earlier. That's where I found you, from their website! There are so many recipes that I would like to try. The Pumpkin Coconut Cream Soup is one of them! I subscribed to their newsletter, and they have free shipping today only! The coconut peanut butter cookies look divine! We made sugar cookies with m&m's last night (not a recipe from their cookbook) and used tropical traditions coconut oil instead of butter. Crunchy and good! I already am subscribed to their email newsletter and also follow them on twitter. Love this coconut oil!!! Would love to try the Classic Coconut Macaroons Recipe! I'm going to try the Gluten Free Crepes. I'd love to try the choc coconut protein bars! I would like to try the cocunut peanut butter cookies! We love coconut oil! I signed up for the newsletter. Thanks for the chance to win such a gerat product! I subscribe to trop trad newsletter. Since today was free shipping day I also placed an order! the coconut granola sounds divine! I want to try Gluten Free Chocolate Chocolate Chip Pancakes. I just subscribed to your newsletter and am looking forward to trying MANY of the recipes! I'd like to try the recipe for the Coconut Oil Lime Tuna Steaks….as well as many others! I'd love to make the Iced Coconut Mocha Cappuccino because my fav drink at Starbucks is costing me $5 a pop!!! I signed up for the Tropical Traditions newsletter, am following them on Twitter, tweeted about the giveaway, and can't wait to make Gluten Free Toasted Coconut Ginger Blondies! I have subscribed to the Tropical Traditions Newsletter and to Girls to Grow. I enjoy making granola and have my own recipe for some pretty delicious stuff. I just recently discovered coconut oil so I have not yet tried the recipe using coconut oil. I look forward to trying the Loaded Coconut Oil Granola. I just signed up for the newsletter. I've never tried coconut oil. looking foward to it. I want to try the coconut treasure cookie receipe. the recipes look so good, I would have to try alot of them. one that struck me first is the vanilla coconut cream candy. A new day and a new tweet – @GirlstoGrow has a #giveaway for @Troptraditions 32oz. #Organic Gold Label Virgin Coconut Oil! Ends 7/31 http://goo.gl/fb/imS32. I signed up for the newsletter. Tropical Traditions sounds like a great company! I follow TT on Twitter @noteasy2begreen. I would love to try the coconut peanut butter cookie recipe. Yum! I would like to try their recipe for Rhubarb strawberry pie with coconut oil pie crust. I subscribe to the Tropical Traditions newsletter! I follow Tropical Traditions on Twitter (winitmamawins)! Another day another tweet! @GirlstoGrow has a #giveaway for @Troptraditions 32oz. #Organic Gold Label Virgin Coconut Oil! Ends 7/31 http://goo.gl/fb/imS32. I would like to try the coconut fried shrimp!